This was probably for first challenge I did. For the almost 3 years my husband and I were paying off our debts, we only had staycations when we took time off work. This saved us thousands of dollars over the years and helped us get creative and learn our city more as we were forced to find cheaper alternative options in the city. If it is not on the budget, it does not get purchased. We all have impulse purchases. My impulse purchases are Tim Hortons, French fries and chocolate bars. During the no spending on impulse items challenge, I was not allowed to purchase these items and over time I realized I didn’t really need them. When I was able to purchase them, I bought them less often. There are some spending habits that are impulsive and happen sporadically. There are other spending habits that are more habitual and develop out of the routine of daily living. For example if you buy a lunch at work every day, always eat out on the weekends, or always buy coffee in the morning at a particular coffee shop, these are habitual spending habits. These habits are difficult to cut off cold turkey because of their habitual nature. 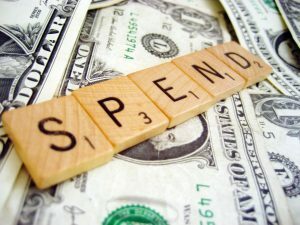 An alternative approach to cutting habitual spending entirely is using the step-back method to curb spending. In this method, you cut back on buying this item each week until you no longer need to purchase it. For example, if you buy lunch at work every day, reduce this amount to buying your lunch 3 times a day and packing a lunch the other two days. A couples of weeks later reduce it even further to buying your lunch twice a week and packing the other 3 days. Then only buy your lunch once a week (e.g. Friday). Finally, cut out buying your lunch altogether. This entire process may take a few months to set in place, but is it more successful than cutting off your spending all at once. If you really want to get aggressive with your saving, you can cut your spending to the bare necessities only. This typically includes only food, transportation and your essential bills like cell phone and electricity bill. Spending on bare necessities removes the possibility of buying wants, or even needs that don’t require our immediate attention. For example, you may need to update your work wardrobe, but this would not be considered a bare necessity and should not be purchased during the challenge. Pick a day during the week or weekend where you tend to spend the most amount of money. For many people, this tends to be during the weekend (but not always). 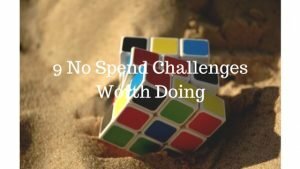 Once you have selected a date(s), challenging yourself not to spend a single cent that day on anything, at all. Start slow by doing a no spending day, then transition to two days or a weekend. If you really want to get aggressive it, stretch it as far out as a week. In my experience, a week is the most I have gone without spending money on anything including gas, groceries etc. So much of the food in our kitchen cabinets and pantries are not used. Canned beans, soups, pastes etc. Implement a pantry challenge and work towards using as much pantry items in your kitchen as possible. This challenge is a good way to save money on groceries during the challenge and clear out some space in your kitchen. If you already don’t drink pop or juice then this won’t be much of a challenge for you. However, many Americans do spend money on pop or juice and these small expenses can add up over time. Instead of drinking sugary drinks like pop or juice, substitute this with water. Water is not only extremely healthy for our bodies, but our bodies are 65% water, making it a need for healthy living. We also get to enjoy the added benefit of saving money. Buying clothes is fun. Clothes help us convey our personality and style to others and can even make us feel good. However, the cost of buying clothes can add up if not managed well. The clothing challenge forces you to freeze making any clothing purchases during the challenge. Rather, it forces you to get create with the current wardrobe. This can be a great opportunity to rediscover someone of your clothing and put together different styles. An added bonus to the clothing challenge is the savings that can be realized over time. Although spending money on gifts can be a kind gesture to those receiving the gift, it can also lead to a lot of spending. This challenge can be general and cover all gifts to all people, or it can be specific and cover certain gifts for certain holidays or people. For example, you can set a challenge not buy any gifts for anyone this Christmas, or you and your spouse can agree in advance to not purchase each any gifts for your birthdays/anniversary.